Stoke City seem to have surprised many in recent years by not being involved in the basement battle which has seen many good sides go down. Stoke always seem to be able to achieve that safe mid-table finish. Stoke’s squad is built around having technically gifted midfielders they are solid and reliable but lack the attacking spark of say Everton or Spurs teams with a similar budget but a different play style. The gameplan has not changed much since the departure of former manager Pulis who was the man that built this side into the team that don the red and white today. They started last season with an indifferent run of form really setting the tone for the season. Their away form looked good until the 4th October when a trip to Sunderland derailed that as Stoke were beaten 3-1 with Adam scoring the only goal for Stoke. Their most promising early season display was a great win over Manchester City as Stoke won 1-0 courtesy of Diouf, it was made all the more impressive with the game having been at the Etihad Stadium. 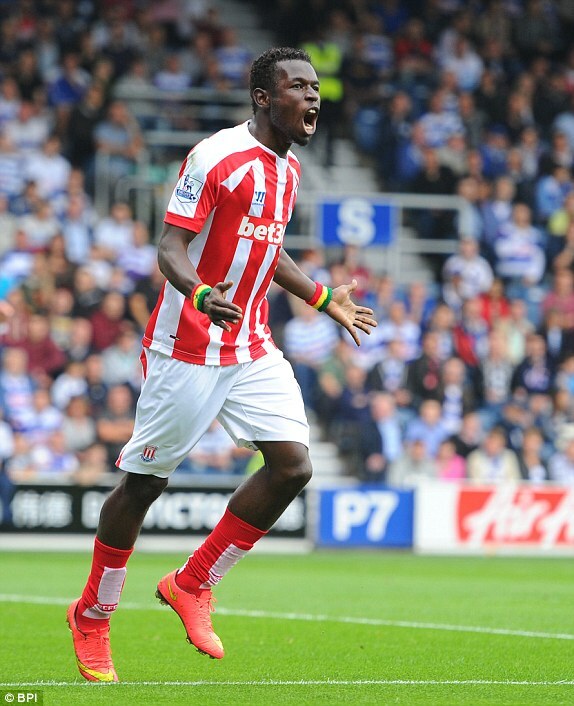 Mame Biram Diouf celebrates a goal against QPR. Stoke’s life in mid-season was made more difficult by a tough run of 3 games against Manchester United, Liverpool and Arsenal. After 2 losses to both Liverpool and Manchester United, Stoke were on a run of 3 straight losses, an emphatic 3-2 win over Arsenal at the Brittania Stadium saw Stoke pick themselves up and give their team a fighting chance of European football, the end goal for Stoke in any given season. This win however was avenged on 11th January as Arsenal won 3-0 in the return leg. Undoubtedly Stoke’s best football was played at the end of the season smashed Tottenham 3-0 before a draw with Burnley followed by the 6-1 destruction of Liverpool ruining Gerarrd’s leaving party. Cup runs seem to be a thing of the past for Stoke, the FA Cup threw up what seemed a routine game against Wrexham which Stoke were losing until the final 10 minutes as Stoke fired home 3 goals in the final 10 minutes the 2nd coming 2 minutes from time and the 3rd in the 4th minute of stoppage time both thanks to former Manchester City player Stephen Ireland. They eventually crashed out to Blackburn Rovers who slaughtered Stoke 4-1 in the 5th round. 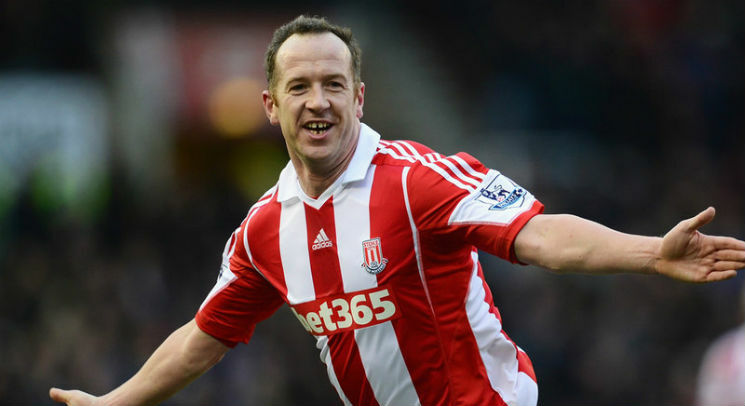 The best player for Stoke last season has to be Charlie Adam, the midfielder was in inspired form especially following Christmas. Ryan Shawcross may be the captain but the midfielder has a role to play in leadership of the club. Adam is tireless and fits the Stoke mould of a powerful, solid midfielder with little creativity, he is the heartbeat of the Stoke midfield offering himself as the man to go through linking the solid defenders with the towering strikers. His passing game is something to be admired whether you are a Stoke fan or a neutral Charlie Adam is a player to watch. Charlie Adam after his outrageous long range effort against Chelsea. Business in the market has seen Stoke snap up 6 new faces and part company with 8 first team players. The signing of Irish keeper Given is big news having lost Begovic to title holders Chelsea resources were looking rather thin on the ground with Butland the only first team keeper but Stoke have boosted the ranks by signing the Irish veteran and the Danish 23 year old Jakob Haugaard. They have also signed England right back Glen Johnson, it was inevitable he would the leave the club what with Nathaniel Clyne moving to Anfield. Johnson will add experience to this squad and bring a wealth of Premier League knowledge. Stoke have also brought in Afellay from La Liga giants Barcelona. The midfielder has 50 Netherlands caps to his name and could be a hugely exciting player to watch should he play a big role in Stoke’s forthcoming campaign. Shay Given making a save for former club Aston Villa. The loss of keeper Begovic is huge for the club, he was a massive asset and he will be missed by fans at the Brittania Stadium but with the pulling power Chelsea have the move was never in doubt especially after the departure of Cech. Steven N’Zonzi is also on his way out the midfielder has been a big part if the club for so many years and was impressive last season for The Potters he will be missed by the club as he leaves for Spain. They have also lost another club stalwart in Robert Huth the 30 year old spent 6 seasons at Stoke and established himself as 1 of the 1st names on the team sheet, he will be missed. Stoke have recruited well and could well mount a challenge for Europe this season they must try and make the Brittania Stadium a fortress and if they can find a plan B alternative to the ‘long ball’ game they have made their own. This entry was posted in Uncategorized and tagged adam, affelay, anfield, Arsenal, barcelona, begovic, blackburn rovers, brittania, burnley, butland, cech, charlie adam, clyne, cup run, diouf, England, etihad stadium, european, everton, fa cup, given, haugaard, huth, ireland, johnson, la liga, leadership, liverpool, long ball, Manchester City, manchester united, mark hughes, mid-table, n'zonzi, netherlands, passing, potters, Pulis, Republic of Ireland, shawcross, Spurs, stoke, stoke city, sunderland, technically gifted, tottenham. Bookmark the permalink.